Shine a Light: Easter Friday reflection? Not in this city of boats. Easter Friday reflection? Not in this city of boats. As a child, growing up in a household where my mother was tragically God obsessed and my Father a non-practising believer, Easter was the one day that we all went to church together. Me to Sunday school and then the parents joining me to sit in the pew for a hell and damnation Southern Baptist sermon. The fun of the day - if any could be found - was wearing a new dress and Easter hat, or bonnet as my Mother loved to call them. She would sing the old song, "in your Easter bonnet" leading up to the big day. Even after my daddy lost everything in his bid to run his own auto repair garage I would at least get a new hat for the day. Times have changed. Mr G is an atheist and I'm pretty much the same. Although, when it's ground into you for the first 16 years of your life, religion is hard to completely turn away from. So Australia, it seems, is the perfect place to be. For a civilised western society Australia is pretty Godless. There's the faithful Catholics who go to their weekly or monthly rituals and the new wave of evangelicals in the Hillsong Church still practising but they certainly can't hold a candle - or whatever - to the hysterics in the USA. Which is reason enough, I suppose, to not be surprise to find a floating city of boats in our usual spot in Refuge Bay on Easter Friday. This is the metropolis we joined yesterday afternoon on arrival in the National Park. Boats of every description jammed into every available space. 'Raft-ups' - which are multiple boats all tied together and hanging on one poor mooring line - are everywhere populated by a mixture of sail and power vessels proving boating is both egalitarian and non discriminatory. Wendy Harmer wrote a good piece in the SMH yesterday about the sometimes yearning for sacred space by Australians since we, as a nation, don't have the non-sectarian rituals of the Americans like Thanksgiving. I think, for many, boating represents a certain kind of worship ... in the church of friendship, sun, and beer. Entering this floating city, Mr G and I were lucky enough to find a club mooring near the all but hidden waterfall. 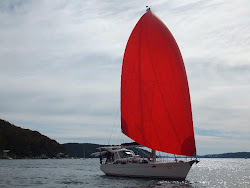 We hauled up the mooring line, launched the dingy and went ashore to play frisbee with Miss Molly. On return to the boat Mr G insisted on solitude to read the paper, Molly drifted off to sleep in the cockpit and I started a new book. The evening ended with a nice meal, lovely wine, a full moon and the occasional sound of some people across the bay enjoying themselves a bit too much....bet they have sore heads this morning. Mr G reading the paper in "Leave me NOW" mode. Miss Molly crashed after a big frisbee & swim session. Today and tomorrow we'll look at storage areas and get our minds ... and the boat .. set to start loading up for the trip north. We're also thinking of joining the yacht club "cruise" which is further down into the national park for their BBQ this evening. More later! Happy Easter to all ... enjoy whatever you do to celebrate this weekend.